Shortly before Thanksgiving, I helped out with a little dinner at the Vischer Ferry General Store. We made salad with orange-shallot vinaigrette, peasant bread, sherry vinegar chicken and polenta, which I had forgotten how much I love. We roasted the polenta in the oven using Paula Wolfert’s recipe, which I had heard about over the years, but, for whatever reason, namely Mark Bittman’s Polenta Without Fear, had never made. 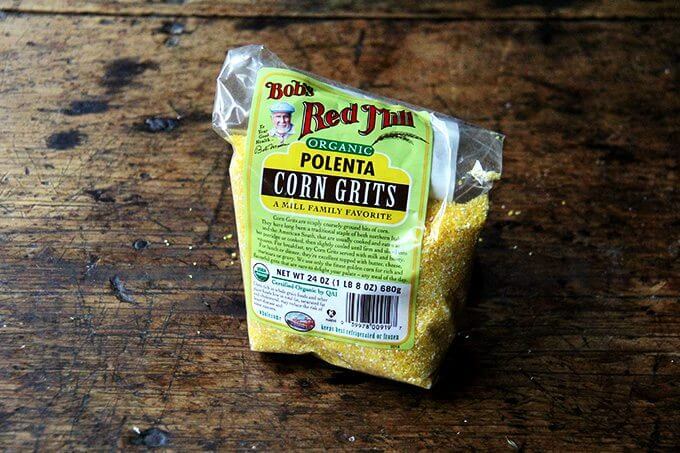 Friends, roasting polenta in the oven is a game changer — it frees up your cooktop and, more important, YOU. While the polenta bubbles away in the oven, you can sauté greens or poach eggs or steam broccoli or take a bath give the kids a bath, etc. No need to worry if the polenta is sticking to the pot, running out of liquid—in the oven it cooks slowly and evenly. This is how you make it: whisk together polenta, water, and milk with a pad of butter and a pinch of salt; throw the pot in the oven; remove it about an hour later. It’s the easiest thing in the world, and this time of year, I could eat it with everything: slow-cooker beans, braised short ribs, sherry chicken, roasted mushrooms—anything that produces a good amount of sauce. 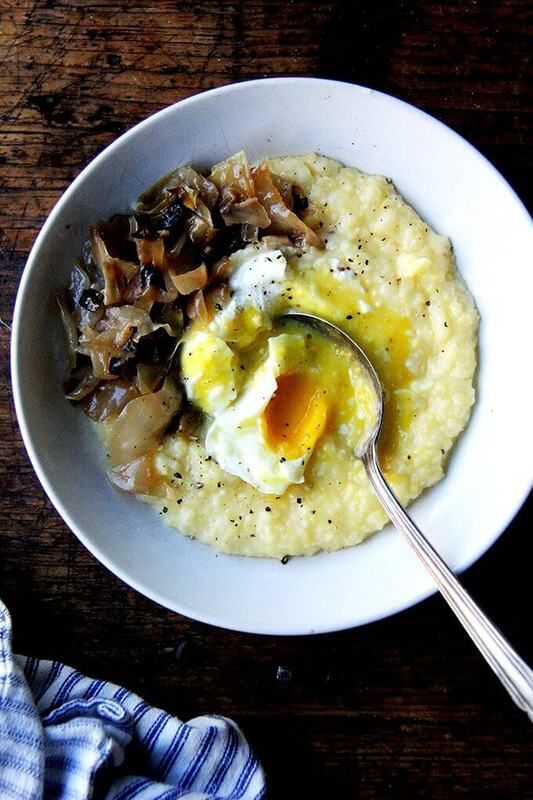 Recently, I haven’t felt like cooking—not sure why … this never happens—but I can always muster the energy to throw a pot of polenta in the oven and poach a few eggs. 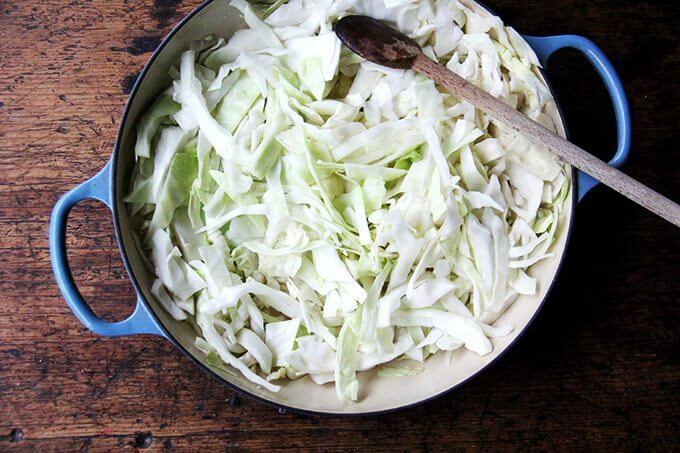 A side of sautéed greens or, as here, caramelized cabbage makes the meal feel complete, though it’s no slouch without it. Friends, what, if anything, do you cook when you don’t feel like cooking? 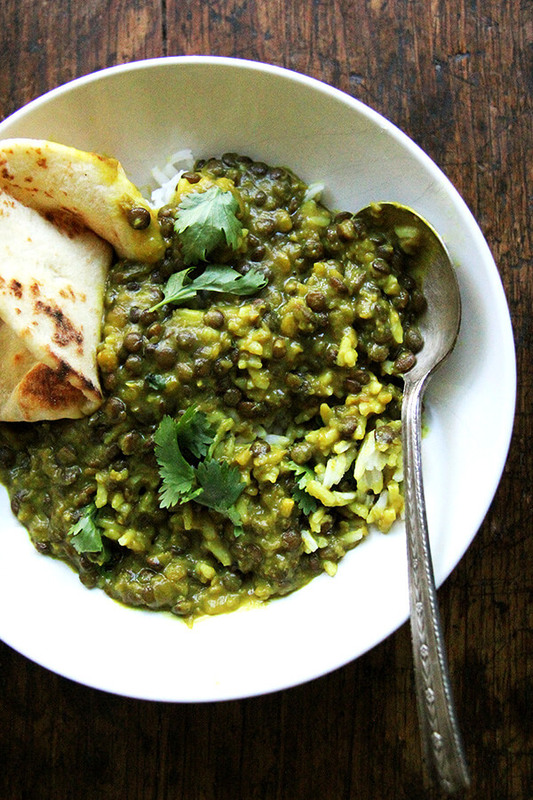 Adapted from this Fine Cooking recipe by Paula Wolfert. Oven-baking polenta is game changing: just throw it in the oven, give it a stir 40 minutes later, bake it for 20 minutes more. For years, I’ve made Mark Bittman’s Polenta without Fear, which is also simple, but I prefer the hands-off nature of the oven-baked version. 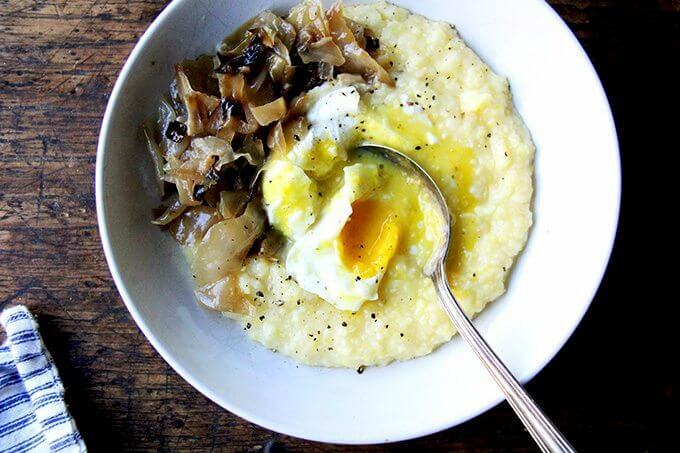 I love the combination of polenta with a poached egg and a drizzle of truffle oil. A side of sautéed greens makes the meal feel more complete. Here I’ve served the polenta with another Paula Wolfert/Fine Cooking recipe for caramelized cabbage, which takes longer than quickly sautéing greens, but which is a good one to know should you find yourself overloaded with cabbage, as I found myself a few weeks ago. Polenta is also delicious with this sherry vinegar chicken, braised short ribs, and most recently I spooned these slow-cooker beans over it, which was also delicious. Re water: If you use 5 cups of water, it will take longer for the polenta to thicken up, but in the end, it will be ultra creamy and delicious. 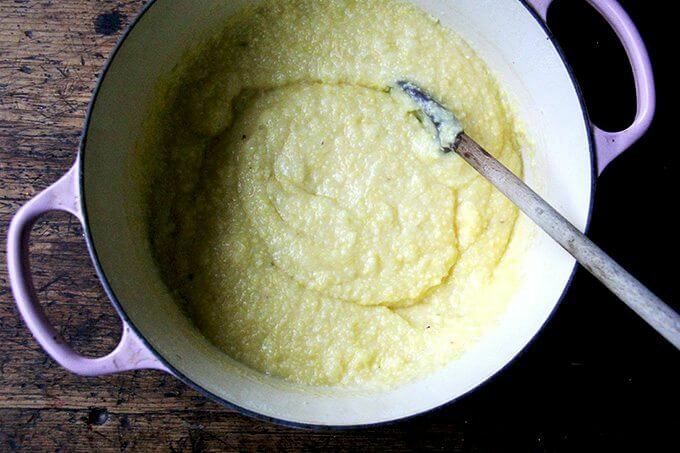 Four cups still yields a creamy polenta, and it will allow the polenta to thicken more quickly. You can use all water if you don’t want to use any milk. Heat the oven to 350°F. 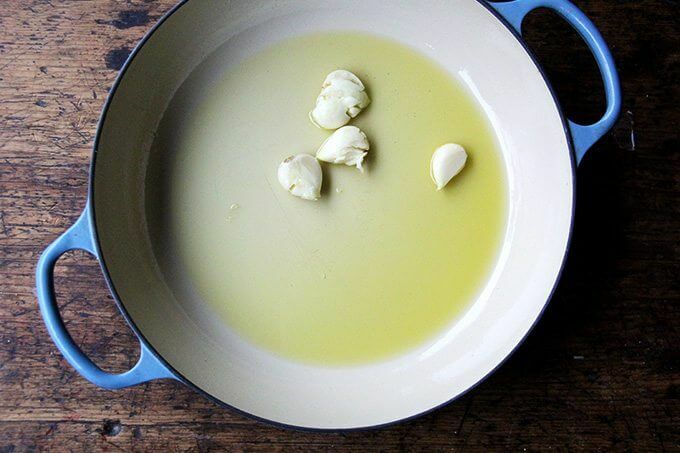 Grease a large ovenproof skillet or Dutch oven. 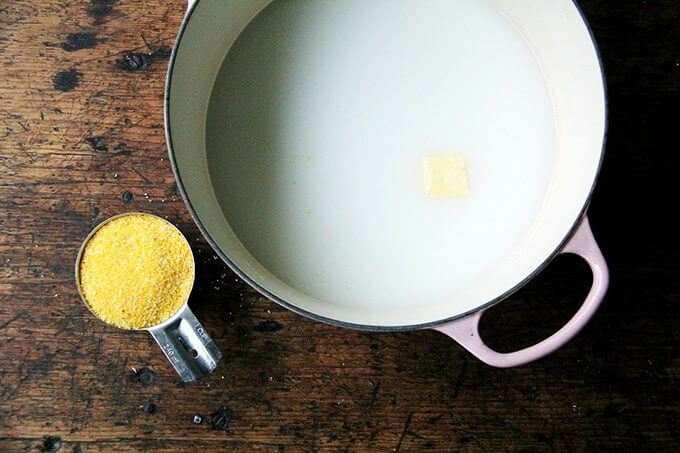 Pour in the cornmeal, water, milk, butter, and salt, and stir with a fork or whisk until blended. The mixture will not look emulsified. Bake uncovered for 40 minutes. Stir the polenta, taste, add salt if needed, and bake for another 10 to 20 minutes or longer—until it reaches the desired consistency you like. 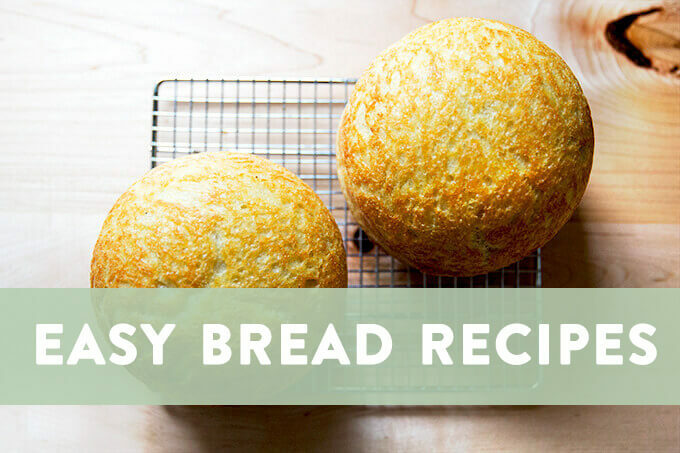 Remove from the oven, stir, and serve immediately or cover and keep warm until you are ready to serve. To poach eggs: bring a shallow saucepan filled with water to a boil. Crack eggs into individual ramekins or small bowls. Add a splash of vinegar to the water. Lower the heat so that the water is barely simmering—it should barely be moving. Slowly lower each ramekin to the water and pour out each egg. Set a timer for 4 minutes. Use a slotted spoon to lift egg out to test for doneness—the whites should be completely set; the yolk should feel soft to touch. This will take practice—after you make one or two, you will know by touch if the egg is done to your liking. I typically poach eggs for 4 to 5 minutes, but the length of time changes depending on how many eggs I am cooking at one time. Note, too, that you may have to adjust the heat level to keep the water at a bare simmer. When the eggs are done, transfer them to a paper towel-lined plate to drain briefly. 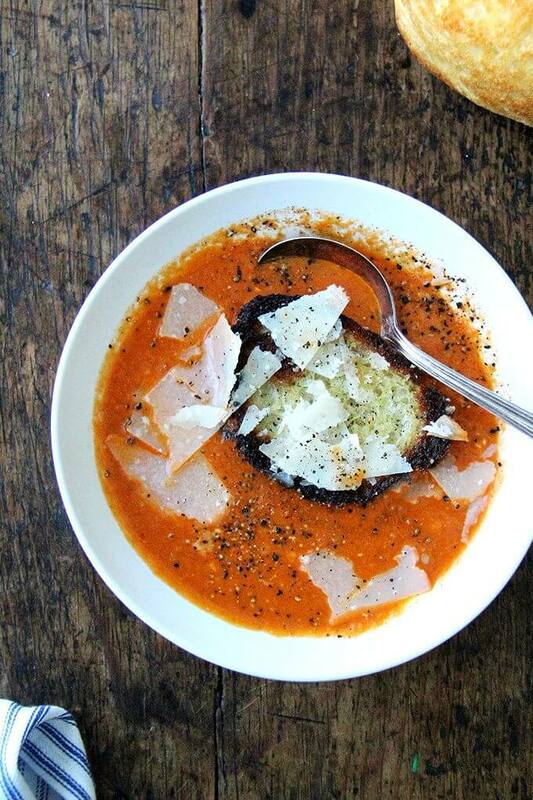 To serve: Spoon polenta into bowls. 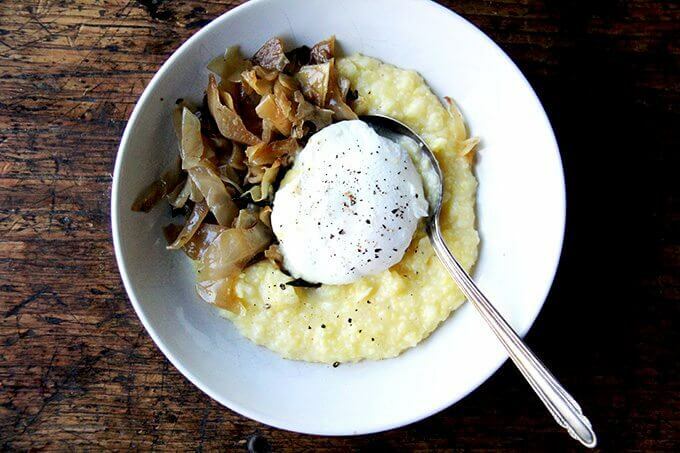 Top with shavings of parmesan, if desired, and top each mound of polenta with a poached egg. Season with a pinch of sea salt and pepper to taste. Drizzle with truffle oil, if desired. Serve with greens on the side, if desired. Also can’t wait to try that cabbage. 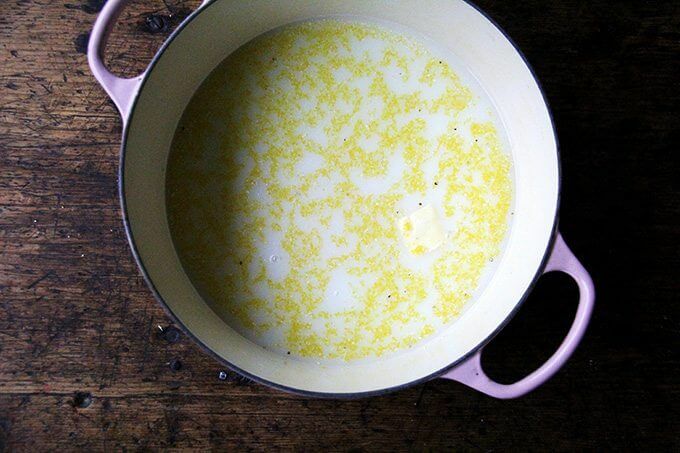 This Tamar Adler recipe for arborio rice and lettuce soup has been my go-to lately when I don’t feel much like cooking and when I have a lot of outer leaves of a big lettuce after using all the sweet little inner leaves up in a salad, which seems to happen fairly often (the lettuce overload). It sounds so plain but these few ingredients together taste really amazing. Better with homemade stock, natch. 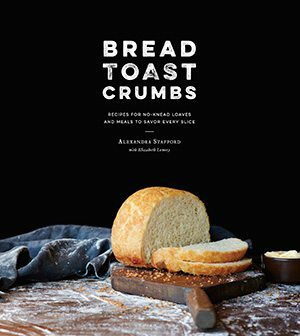 Any of the essays in her book, an Everlasting Meal, where this recipe is from, might also inspire a cook with the blahs. Hi Lucy! So sorry for the delay here. I hear you re the Dutch oven … it is heavy! A buttered casserole would work just fine. I’ve never done this with milk, but I bake polenta all the time using a 4 (water) to 1 (polenta) ratio. I got the idea from Russ Parsons. He says he got the idea from back of the bag (or box) of Golden Pheasant polenta. Wherever it’s from, you’re so right – it is a gamechanger! I’ve been meaning to try with just water — I’m sure it’s still creamy and delicious. Next time 🙂 Thanks for writing! I have now tried the +milk version and can tell you that it is definitely a bit creamier and, well, milkier than the all water version. But the all water version is still great and, if you don’t have milk, will work very well. I forgot to grease the pot first though (I don’t grease it with the water version) and I can also tell you that you do *not* want to forget that step. Well cooked milk protein is a serious pain to scrub off (whoops) but the polenta was totally worth it. Thanks for sharing the recipe!!!! 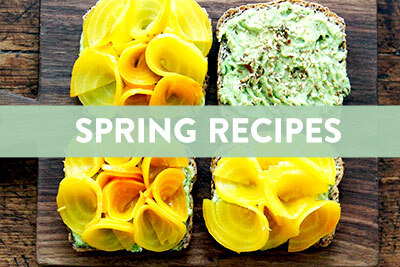 Wow this looks BEYOND delicious–and so simple! Can’t wait to try. You are a goddess. How how how do you always read my mind? To say I’m tired of cooking and exhausted right now is an understatement. I’m in the midst of baking/cooking for Miles 3rd birthday party (tomorrow). It’s our first opportunity to have people over to celebrate his birthday and I’m excited (and nervous). And also TIRED. Plus next up is holiday cookie baking. Oy. I need and require these kinds of dinners. I normally lean on sweet potato quesadillas (which I always mean to post) for fast dinners. 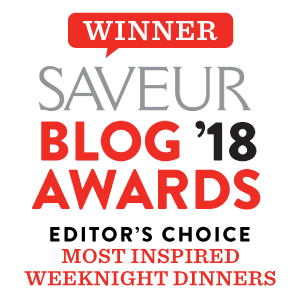 – Maybe you should have a new Pinterest board or category on your site: What to Cook When You Don’t Want to Cook. – You’re saving me. I’ll be making this soon. And I love my veggies with these meals. It makes the baby kick too. 🙂 – Lots of hugs to you guys. Hi Ginger! So happy to hear you liked this. Great to know that cashew milk will work in place of cow’s milk. And yes, cutting back the liquid should help speed up the process … nice work taking it to the stovetop to speed it up. 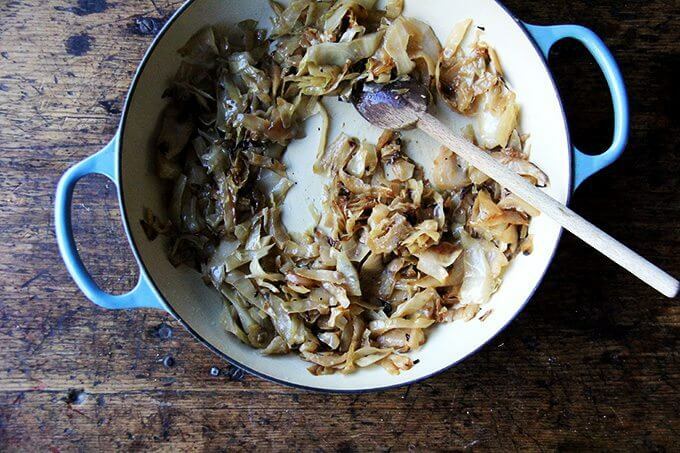 I love that caramelized cabbage, too. 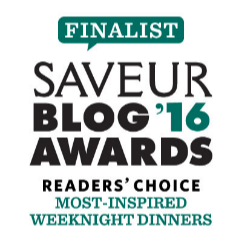 We get so much cabbage in our CSA, so I’m always looking for new recipes. Thanks for writing! 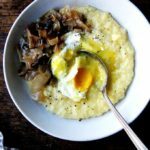 Love the idea of baking polenta! I have not felt like cooking for awhile ( a long while actually). So not like me. But, this I can get on board with! Can’t wait to try it. Thank you for sharing, Ali. Hope you are doing well! Trish, so great to hear from you!! Hope you are well, too. 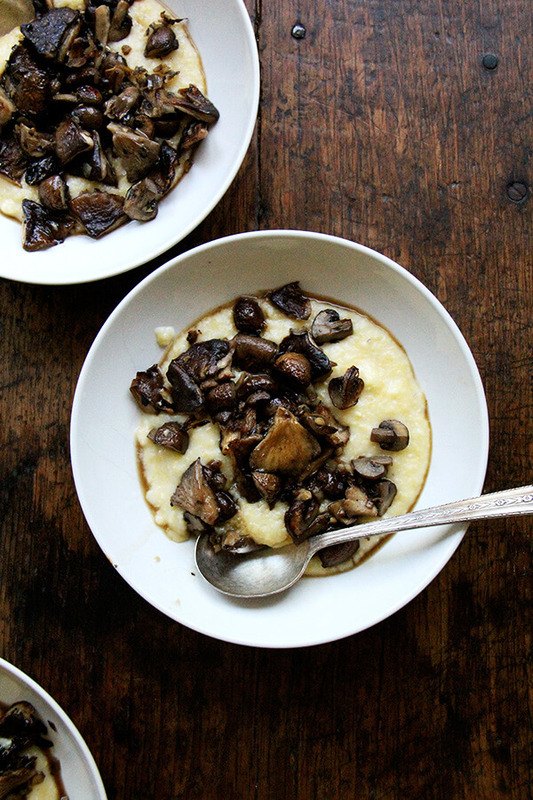 Hope you like this polenta … I can’t get enough of it. This looks delicious! I just happen to have half a head of cabbage, too. Hi Berta! I hope you like it. Maybe the polenta can be made in the instant pot? 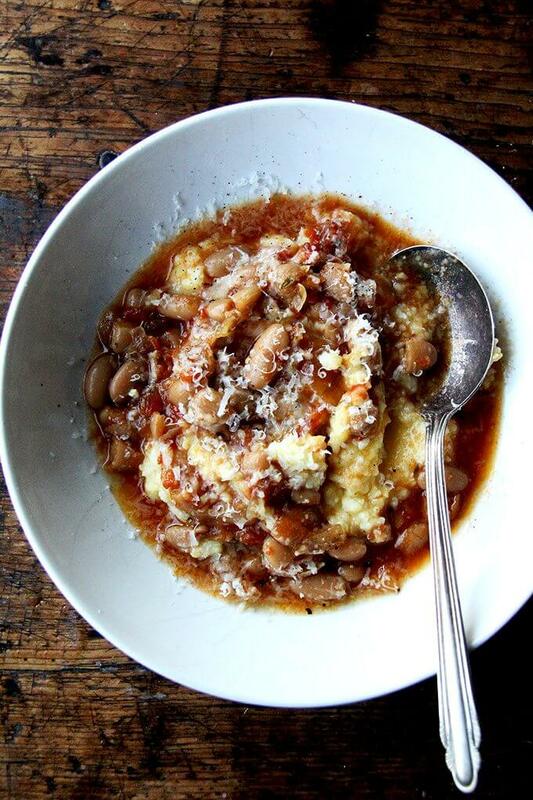 I just made the polenta and slow-cooker beans and both are delicious! Question, do you think I could reduce the amount of oil in the bean recipe to 1/8 cup instead of 1/4? Thanks so much. Yay! So happy to hear this. Yes, absolutely, give it a go. You can always add more oil at the end. Approximately how many servings of polenta does this yield? SO sorry for the delay here!! I would say 3 to 4 servings. Well I made it and it was terrific and so easy! Served with some roasted veggies and Italian sausage. Leftovers got an egg in the morning. Thank you for the idea, I had never heard of using the oven for polenta but it will be my go to in the future. So happy to hear this, Stacey!! Veggies + sausage sounds amazing. Thank you for this, Alexandra. I’ve been looking for a way to cook polenta in the oven for a while. I’ll give this a shot! This was the best polenta ever! I used a baking dish and it turned out just fabulous! Beats standing by the stove stirring for 30 to 40 minutes! Thank you Alexandra, I love your website. I also made a chocolate cake of yours today, excited for dinner later! Oh my word!!!!!!!!!!!!! Delicious! This is absolutely fabulous!! !